Peter Buck of REM and Baseball Project fame grinding out a garage rocking cover of the Mummies evergreen hit "You Must Fight To Live On The Planet Of the Apes." Loose and raw. The B-side is the rollicking quasi political song, "The Monkey Speaks His Mind" keeping with the primate feel of things. Two songs about monkeys on a limited one time pressing of only 1000 copies. 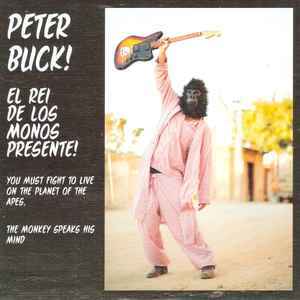 Full color picture sleeve featuring photos of Peter in a monkey mask and pajamas wandering the streets of Mexico.